Echo is a large canyon complex that drops into the main Zion canyon at Weeping Rock. The middle part of Echo ("Middle Echo") offers an amazing canyoneering adventure. A couple of short rappels and some very chilly swims access a long section of narrows deep underground. Due to its large watershed, the pools are often full of water, and they maintain their coldness long into the summer. At times, the pools fill with decaying vegetable matter and smell like poo. Canyoneers sometimes wonder if they will pass out from the smell before making it through the pools. Echo collects a lot of snow and ice over the winter, and should be avoided through the spring. It often stays impassable into June, and the snow blockage occurs after the rappels! In the last couple of years, groups have been rescued so the Park often closes the canyon in the spring until the melt out has completed. Check with the Wilderness Desk for current conditions. One can assure passage in Middle Echo by hiking up from the bottom to the bottom of the last rappel, finding out if such a hike is possible. BEFORE the meltout, it can be possible to climb over the frozen snow and ice, but once flow starts it tends to carve out underneath, creating a hazard way too dangerous for rational human passage. 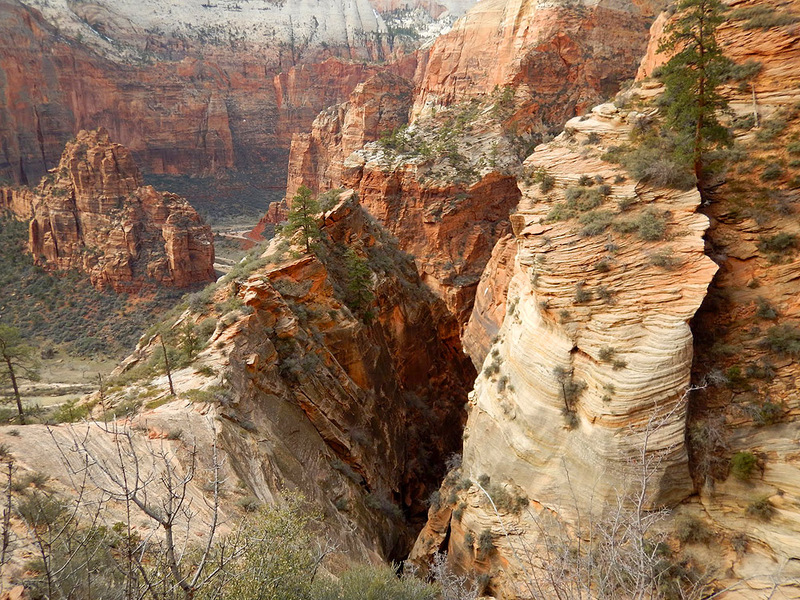 The Echo Canyon Trail is the oldest trail out of Zion Canyon. In the late 1890's, Utah pioneer John Winder reworked the existing Paiute foot trail to drive cattle up to the rim. The trail was improved and the Observation Point Trail cut into the side of the mountain in 1925. REQUIRED. Group size limit is 6. No special difficulties, but in certain conditions, one pothole exit can be difficult to do without a partner assist. Soloing Echo is not recommended. Moderate – Sustained narrows take only 1-2 hours to traverse, but the collection basin is large and all slickrock. Zion free shuttle (March-Nov) or your own vehicle to Weeping Rock Trailhead. Winter - Echo collects a lot of snow and ice over the winter, and should be avoided through the spring. It often stays impassable into June, and the snow blockage occurs after the rappels! In the last couple of years, groups have been rescued so the Park often closes the canyon in the spring until the melt out has completed. Check with the Wilderness Desk for current conditions. The Observation Point Trail starts at the Weeping Rock parking lot / shuttle stop and switchbacks up the slope below the vertical face of Cable Mountain. Nine hundred feet (300m) above the canyon floor, the trail traverses left below the smooth face and enters the gravelly wash of Echo Canyon. The trail follows the wash about a hundred feet (30m) then ascends the left side of the canyon (left looking up). The section of Echo Canyon above this crossing is called Middle Echo. The section below is Lower Echo, which is considerably more difficult, and requires ascending fixed ropes to get back out. Continue up the trail 1/2 mile (800m) to where the Echo Canyon Trail branches off right. It is signed for Cable Mountain and the East Entrance. The main trail continues up to Observation Point. The smaller Echo Canyon Trail descends diagonally toward the bottom of the canyon. Follow the trail 0.25 mile (400m) to where it crosses a shallow drainage. Follow the trail another 50 feet (15m) further, then step into the woods and follow small trails along the rim, then down steep dirt into the canyon. The canyon narrows right away. Enjoy the cool shade of the canyon after the sun-scorched slickrock of the approach. Suit up before the first wading pool. The first rappel shows up after 20 minutes. Chose an anchor carefully, test and evaluate, then rap a V slot into a pool. The second rappel follows soon after, into a pool; and then the third, also into a pool. The third pool can be difficult to exit and might require a partner assist. Downcanyon a few minutes, one more rappel into a pool completes the rappelling. 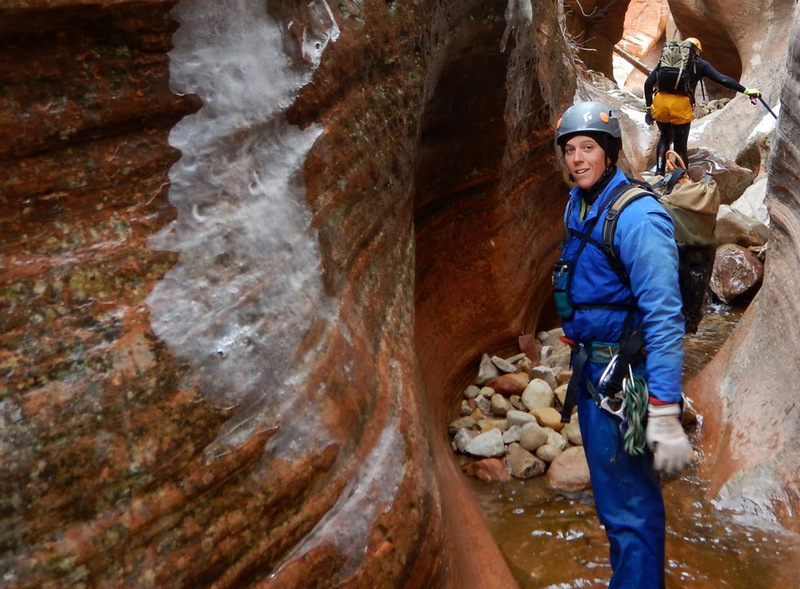 Fabulous canyoneering follows, down one of the best slot canyons in Zion. Downclimb and walk down the soaring corridor. Enjoy the excellent acoustics of the Echo Chamber. After half an hour, a few wades or short swims lead to familiar ground where the trail crosses Echo Canyon. Warm up in the sun and pack your gear. Hike the Observation Point trail back to Weeping Rock Trailhead.